This article was co-written by Julianne Norman and Liz Randolph, both from the International Education division of RTI International who were involved in the process described below. Journeys was launched on June 27, 2017 by the First Lady and Minister of Education and Sports, Honorable Janet K. Museveni, and the US Ambassador to Uganda, Honorable Deborah R. Malac, during the national commemoration of the Day of the African Child. It has since been rolled out to 2,600 public primary schools in Uganda. Although data-based evidence is still forthcoming, anecdotal evidence of Journeys’ success suggests that Ugandan schools are well on their way to becoming positive and safe environments for learners and teachers alike, as illustrated by Sylvia’s story, below. School-related gender-based violence (SRGBV) is widespread globally and includes bullying, harsh forms of punishment, and sexual harassment and assault. According to a 2012 Uganda Ministry of Educatoin and Sports (MoES) study (as cited in UNICEF, 2013), 77.7% of children in primary schools in Uganda (i.e., primary classes P1 to P7) reported that they had experienced some form of sexual harassment or assault while they were in school—51% of whom were aged 10 to 13 years. Further, more than 80% of students in this nationwide study reported experiencing some form of harsh punishment, while more than 80% reported either witnessing or personally experiencing bullying. 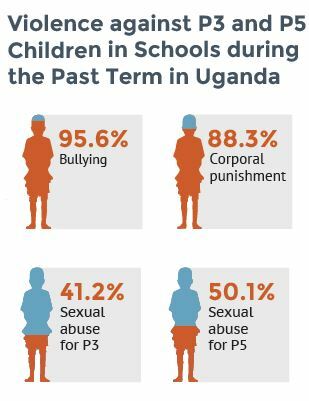 In LARA’s USAID-funded baseline study 95.6% of students reported being bullied in the past term and 88.3% said they were subjected to corporal punishment within this time frame. While 41.2% of P3 students said they had experienced sexual harassment in the past term, this number was higher among P5 students of which 50.1% reported this experience. Although both boys and girls experience all forms of violence, they experience violence differently due to socially constructed gender and power inequalities that are prominent in their school and community institutions. Commissioned to address this issue, the United States Agency for International Development (USAID)/Uganda-funded Literacy Achievement and Retention Activity (LARA), implemented by RTI International, developed a unique approach to combatting and preventing violence of all forms in schools based on the following logic model: If life at school is characterized by a positive and supportive school climate, a violence-free environment, and effective instruction, then students enjoy learning and participate in class without fear of humiliation and punishment, remain in school throughout the primary cycle, and succeed in their school work. If life at school is characterized by a positive and supportive school climate, a violence-free environment, and effective instruction, then students enjoy learning and participate in class without fear of humiliation and punishment, remain in school throughout the primary cycle, and succeed in their school work. As such, the LARA team produced Journeys, an innovative approach to eliminating violence in schools, which was informed by research on school climate and social and emotional learning; known mediators of SRGBV, such as cultural norms related to gender and power relations; adult experiential learning models; Ugandan educationist views and expertise; SRGBV prevention and intervention case studies; and the Massachusetts Institute of Technology’s Presencing Institute U-Model. The Journeys approach is unique in that it applies awareness-building social technologies, such as guided reflection, and prototyping to allow individual and collective actions for social change to emerge naturally rather than conducting any form of direct training or “sensitization.” Recognizing that the gender norms and power relations that produce and maintain SRGBV are entrenched throughout schools and communities, the approach is designed to engage all of the key actors in school change: teaching and non-teaching school staff, community members, and students themselves. 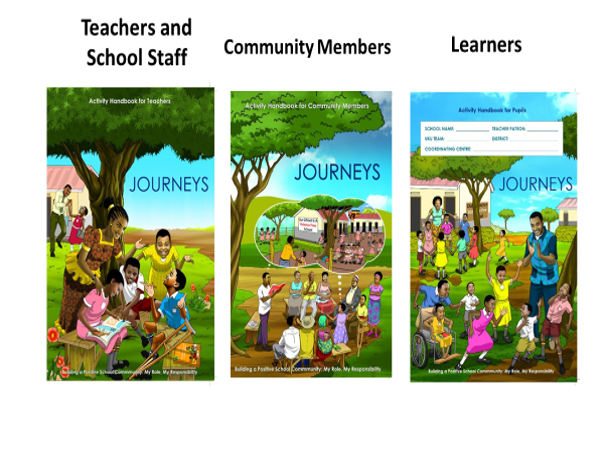 Journeys is implemented through a set of three activity handbooks (Journeys Activity Handbook for Teachers and School Staff, Journeys Activity Handbook for Community Members, Journeys Activity Handbook for Pupils), each of which is specifically designed to provide a facilitator with a set of activities that guide reflection, stimulate dialogue and promote idea generation related to building a positive and supportive school, where violence cannot thrive. Journeys was launched on June 27, 2017 by the First Lady and Minister of Education and Sports, Honorable Janet K. Museveni, and the US Ambassador to Uganda, Honorable Deborah R. Malac, during the national commemoration of the Day of the African Child. It has since been rolled out to 2,600 public primary schools in Uganda. Although data-based evidence is still forthcoming, anecdotal evidence of Journeys’ success suggests that Ugandan schools are well on their way to becoming positive and safe environments for learners and teachers alike, as illustrated by Sylvia’s story, below. Nabatanzi Sylvia, the Head Teacher of Bamusuta Primary School remarked on her transformation while participating in the Journeys training for teachers: “During [the] Journeys program, as we were sharing our own experience of violence at school, I realized how painful it had been [for me]. I decided not to do the same to my learners.” That is why Sylvia worked hard to guide her entire school staff (teachers, the school chaplain, and the school management committee) through the Journeys experience. She emphasized to them that the school culture and the mindsets of teaching and non-teaching staff must change. Sylvia admitted, “I used to think that you cannot run a school without corporal punishment, but during the Journeys program, I was exposed to other ways of disciplining.” Sylvia recognized that a shift in attitudes toward discipline would not take place overnight, but that it would be a process which she and her staff would work through together. To this end, every Wednesday morning since she attended Journeys training, Sylvia and her teachers discuss ways to improve the safety and well-being of learners, as well as better acknowledge the rights of learners in their school. Sylvia made sure to include her learners in the process as well. She empowered learners at her school to form their own disciplinary committee, which is led by six student leaders from P4 to P 7. Teachers also formed their own disciplinary committee to work with the student disciplinary committee to handle specific and more delicate cases. “Student leaders on this committee provide effective peer support to promote positive behaviors. Further, when disciplinary actions are decided, the student representatives advocate for the rights of their peers” (LARA, 2017). As 2,600 primary schools throughout Uganda begin to implement Journeys, LARA expects to hear more stories like that of Sylvia. To access the Journeys Activity Handbooks, click here. UN Girls’ Education Initiative (UNGEI) and UNESCO. “School-Related Gender-Based Violence Is Preventing the Achievement of Quality Education for All.” Policy Paper 17. New York: UNGEI, 2015. LARA. “Year 3, Quarter 3 Project Report”. Uganda: RTI International, 2017.